Yesterday, we saw how Walmart, in killing ShippingPass without introducing a substitute, doesn’t really seem to grasp the challenge that Amazon Prime represents to the retailer’s online strategy. You only have to be a Snapdeal customer to be able to avail this special bundle, and at no extra cost, the service does make it a very attractive offer. Unlike Amazon Prime and Flipkart Assured that cost a little over Rs. 500 a year, Snapdeal Gold will provide you better service with no addition to your bill. 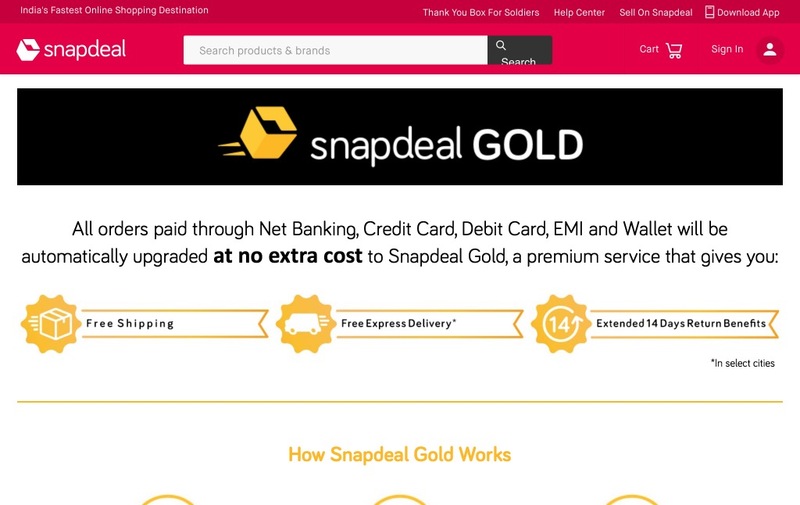 Last but not the least, Snapdeal Gold will offer you extended 14 days return policy, something the company had abolished previously when it came to returning defective products. ​Snapdeal hasn’t evolved Snapdeal Gold yet. But the option is there and will remain there. ​Like Walmarts unnamed free, fast shipping option, Snapdeal Gold is free of additional costs for the customers. “​Walmart Gold” (or something similarly named) could have been the starting point for differentiating Walmart’s online operations. Walmart could have done everything else the same way. Eliminate the membership fee, restructure the delivery options. But also keep or introduce something customers can get attached to that gives you also an opening down the line. It boggles the mind that Walmart did nothing in that vein.